Best Way of Keeping Diseases off Balance! Higher input costs have caused many corn producers to contemplate reducing the number of corn acres they plan to plant in 2001. The impact of oil prices on fertilizer (specifically nitrogen) costs may still change as we get closer to planting. The majority of these acres would switch to soybeans. My concern is that most of these soybean acres will be planted in fields that have already had soybeans for one or more years. The result is likely to be more soybean diseases. Short-term gain for long-term pain! This has been the case in southern Ontario, where we have seen an increase in soybean diseases from reduced crop rotations. Diseases on the rise include soybean cyst nematode, white mould, phytophthora root rot, rhizoctonia root rot, sudden death syndrome, stem canker and brown stem rot. It is necessary that producers increase their rotation options by keeping corn, wheat or other crops in the rotation. Crop rotation provides producers with one of the most effective and economical methods of controlling plant diseases. Unfortunately, the importance of a good crop rotation is often overshadowed by other considerations. Some of the benefits that crop rotations provide producers include: (i) increased yields, (ii) optimal utilization of nutrients, (iii) erosion control, (iv) insect and weed control, (v) labour and machinery requirements spread over a larger portion of the growing season, and (vi) reduced disease risk. How does disease develop in your field? 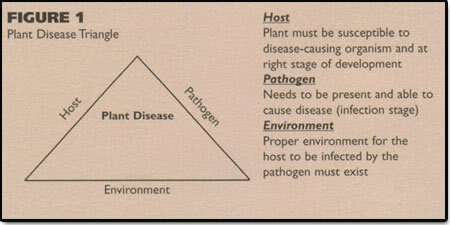 Imagine the disease potential of your field as a equal-sided triangle where the three sides are labelled host, pathogen and environment. The interaction of these three factors determines the disease risk potential of your field. Plant pathologists refer to this as 'The Disease Triangle'. For a disease to occur, the plant and pathogen have to come together under suitable environmental conditions. If any of these three factors are absent, disease development is either reduced or not possible at all. Management is one way you can reduce or minimize the disease risk potential in your field. For example, if you switch a susceptible host with either a non-host crop or a resistant variety, disease development is stopped. The same goes for the pathogen: if it is not present or is not in an infective stage, then little or no disease!!! The important thing to remember is that the pathogen has to b e physically present for a disease to occur. This is a point that growers sometimes forget and, at times, it is tempting to think of disease outbreaks as being related to the weather or some other factor. When less then ideal environmental exist, the pathogen's ability to cause disease on a susceptible host is reduced. Visually think of it as a narrow triangle, since the three sides no longer have an equal influence on disease potential. The best method of minimizing the proliferation of disease inoculum is by using a rotation or crop sequence in which each crop is resistant to the diseases of the crop grown the previous year. Most pathogens survive in crop residue, but only for a limited time, and most pathogens do not infect multiple crops. Crop rotation reduces the potential for serious infestations of pests associated with one specific crop or its residue. For this reason, it is important that we do not sway off course since the consequences will be greater economic losses from yield decreases due to pests (disease, insects, weeds) as well as other factors and increased production costs (fertilizer, pesticides, etc ). Now is the time to sit down and contemplate how to keep corn and wheat in your rotation. Overuse of any one crop will increase disease pressure. By rotating, you minimize your potential for serious disease outbreaks since each crop is resistant to the diseases of the previous year's crop. So take full advantage of this very effective management tool and ROTATE! ROTATE! ROTATE! You won't be sorry!